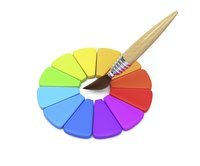 The best way to learn how to change paint colors, mix colors, tint, tone or shade paint is to create your own color wheel. The process is the same whether you use acrylics, tempera, enamel model paints, oils, poster, watercolor or craft paints. Begin the color wheel with the three primary colors: red yellow and blue. All you’ll need for this project is some heavy watercolor paper, the primary colors red, yellow and blue, and a bit of white. You’ll create brown, gray and other neutrals using your mixed colors. To lighten or tint a color or make it into a pastel, simply add white to it; gray added to the color tones or mutes the color, while black shades or darkens it. The artist’s color wheel consists of 12 colors, all created by mixing the three primary colors together to create three secondary colors, and then mixing those with the primary colors again to create six tertiary colors. Once you create your color wheel, you’ll know how to change paint colors by adding white, gray or black, or creating brown. All the colors on the color wheel consist of combinations from the three primary colors, red yellow and blue. Draw a circle the size of a plate on stiff watercolor paper or canvas. Create another circle inside the first to form a border that's about 2 inches thick. Divide the border into 12 equal sections, like the sections on a clock. At the 12 o’clock station, add yellow. At the 5 o’clock station, add red; at the 9 o’clock position, add the blue, filling in the noted sections fully with the color designated for each one. Create the secondary colors on the wheel in the 10, 2 and 6 o’clock positions on the circle. Mix equal amounts of yellow and red to add orange to the 2 o’clock section; red and blue create purple opposite yellow in the 6 o’clock area; mix yellow and blue to add green to the 10 o’clock position. Note that each secondary color sits halfway between the two primary colors on the wheel used to create it. On either side of the secondary colors, you should have two empty sections, for a total of six sections to be filled with the tertiary colors. Create tertiary colors by using a secondary color and a primary color. For example, right next to yellow, mix yellow and orange to create yellow-orange in the 1 o’clock section; adjacent to the orange, mix orange and red and place it between them for red-orange. Continue like this around the wheel, mixing the primary color and the secondary color and putting the result between them in the empty section, following clockwise around the wheel to make red-purple, blue-purple, blue-green and yellow-green. Colors opposite each other on the wheel are complementary colors. Each primary has a secondary color as its complementary color, such as red and green, yellow and purple, and blue and orange. Colors adjacent to each other on the wheel are analogous colors, typically used in three-color analogous schemes such as red, red-orange and orange, or yellow-green, yellow and yellow-orange. Monochromatic colors are actually various tints, tones or shades of the same color, changed to be lighter or darker by adding white, gray or black. If you mix the three primary colors together in equal amounts, you achieve a neutral color that lends itself to the warm or cool side depending on how much red or blue are in the mixture. To create a warm brown, mix a red with its complementary color -- opposite on the color wheel. For example, mix equal parts of yellow and blue to make green, and then add small amounts of red until you achieve the desired brown. If you want to lessen its value, add a bit more yellow instead of white. To create gray, mix equal parts of blue and red to create purple. Then mix in small amounts of yellow until you achieve the desired gray. Add a touch of white to lessen the intensity or value of the gray.